Poems written by Wham! singer George Michael when he was just 11 years old have been unearthed by an old primary school classmate. Penny Ling, 51, went to school with the-then Georgios Panayiotou and the pair would often play childish games together with other children on an estate in north London. The pair met at the Roe Green Junior School in Kingsbury and it seems the songwriter penned a number of poems in 1974. 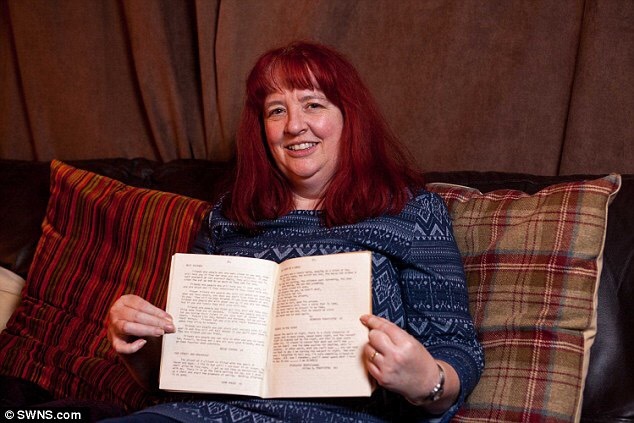 Ms Ling found the two poetic rhymes in her school yearbook by chance and kept it a secret for almost 20 years. She has now lifted the lid on the poems after his tragic death at his home in Goring-on-Thames, Oxfordshire, on Christmas Day last year. 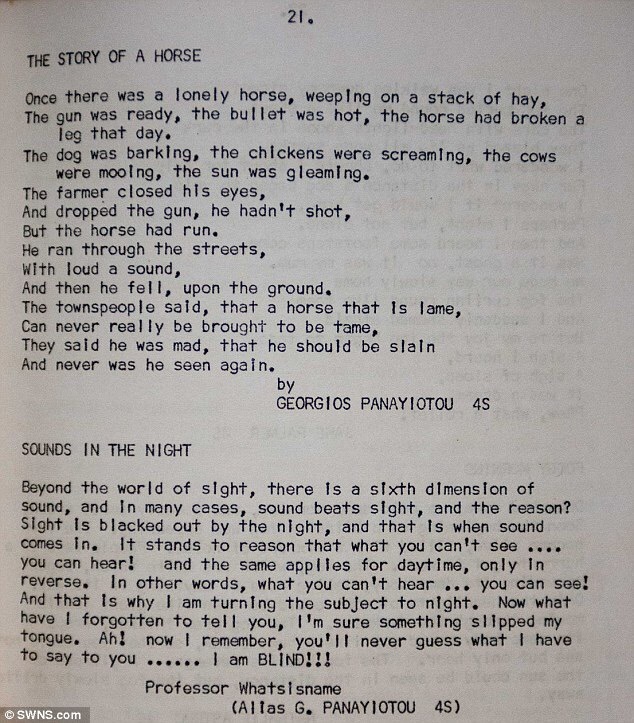 The two poems ‘sounds in the night’ and ‘the story of a horse’ provide an insight into the young child who went onto to become the world famous pop star. Even at the tender age of eleven, Michael showed signs of a future lyrical genius through his use of rhythm, emotion and words. The revelation comes weeks after the singer was tragically found dead at his Goring-on-Thames home on Christmas Day after suspected heart failure, aged just 53. Ms Ling, who now lives in Faringdon, Oxfordshire, and her sister both went to school with Michael and she was a couple of years below and her sister was in a class with the singer’s sister Melanie. She first came across the poems after her sister saw the Careless Whisper singer at an awards ceremony in the late 1980s. It prompted Ms Ling to browse through her old yearbook where amazingly she stumbled across the two poems signed Georgios Panayiotou. She said: ‘My sister had recognised his sister at an awards ceremony George Michael was attending, and came back and said “you will never guess who I met”. ‘I think she got his autograph. At the time my sister was a buyer at Tesco and she got taken to the ceremony by one of her customers. ‘When she told me, I then went to my 1974 yearbook and looked through it and lo and behold there were two poems from George Michael. 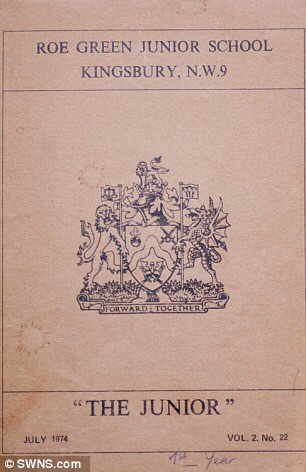 ‘The whole school was represented in the book. It was published once a year. 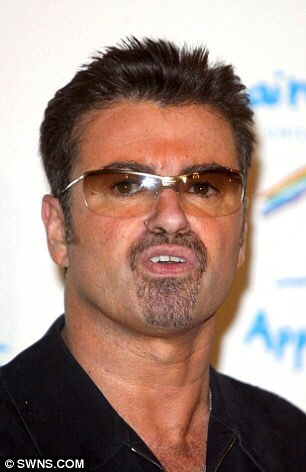 ‘The only people that know about it were friends of mine who were massive George Michael fans. I kept my yearbook locked away in a cupboard. ‘For an eleven-year-old I think the way it’s written is quite complex. He was a couple of years above me. 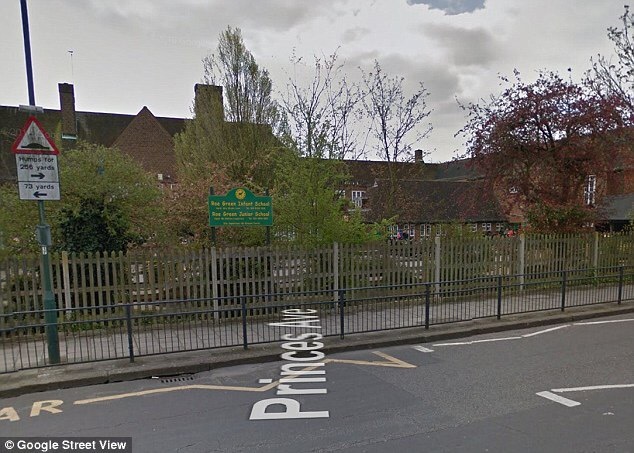 Ms Ling was a few years below Michael when they both attended Roe Green Junior School in Kingsbury, north London. But she would go round to a friend’s house who lived close to Michael’s family after school to play childish games on an estate with other children – where he would join in. She added: ‘The reason I remember him is he lived at the back of my best friend’s house in Burnt Oak, London. The whole area was very multi-national. ‘George Michael’s family were not the only Cypriots living in that community, it was a real mixed bag. ‘I lived the opposite end of the school catchment area. I would go round to friend’s house maybe once a month. The gun was ready, the bullet was hot, the horse had broken a leg that day. The dog was barking, the chickens were screaming, the cows were mooing, the sun was gleaming. But the horse had run. And then he fell, upon the ground. And never was he seen again. Beyond the world of sight, there is a sixth dimension of sound, and in many cases, sound beats sight, and the reason? Sight is blacked out by the night, and that is where sounds comes in. It stands to reason that what you can’t see…. you can hear! And the same applies for daytime, only in reverse. And that is why I am turning the subject to night. Now what I’ve forgotten to tell you, I’m sure something slipped my tongue. Ah! Now I remember, you’ll never guess what I have to say to you…… I am blind!!! ‘She lived in a cul-de-sac and over the back was a bit of wasteland and sometimes we would play in the cul-de-sac if we needed a hard surface – George Michael joined in. Ms Ling said she knew Michael for around three years at school but never expected him to go on have the glittering career he will always be remembered for. She added: ‘I probably knew him from about six to nine years old, so he would have been nine to eleven roughly. ‘I found him to be one of these people to be reasonable quiet and studious. He absorbed what was going on around him.